It's time to lose the snooze button. Sleep is one of my favorite things -- I’ve never been one for alarms though. Potentially because they mark the end of my sleeping. I started working remotely a fews years ago, and intermittently went between working from home and working at an office. Having a more flexible schedule meant I didn’t need to wake up at a certain time unless there was a meeting. Because of this, I’ve experimented with eliminating my morning alarm from my life. Here is how I went about it and how you can too. Either through your phone, or products like Fitbit and Jawbone Up, it has never been easier to track your movement and sleep. I started tracking my sleep and movement a few years ago and at the time realized that 7 hours and 45 minutes of sleep had me at the perfect amount of exercise for the day, but anything past 8 and a half hours and I would keep wanting to sleep. Everyone’s optimal amount of sleep will be a little different. For guidance, the National Sleep Foundation states that people between the ages of 18 and 64 need anywhere from 7 to 9 hours of sleep at night. The the amount of sleep you get feel like enough? When I first started doing this, I quickly realized that I needed around 8 hours to wake up and really feel like I could start my day. Once you figure out where your body is on the sleep scale, it becomes a lot easier to know when to go to sleep so you can wake up on time. I am usually keen on getting up early, around 6 or 6:30 a.m., but what I didn’t adjust in the past was when I went to sleep. I decided that my deadline for waking up would stay firm, but that my deadline for going to sleep would be more flexible. 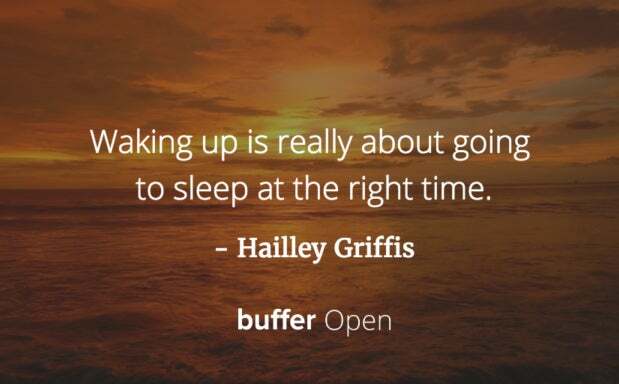 In retrospect, this doesn’t really make much sense -- waking up is really about going to sleep at the right time. Once you’ve learned how much sleep your body needs, it’s easy to do the math to figure out when you might want to start thinking about heading to bed. For me, that’s around 10 p.m. so I can be up at about 6 a.m. naturally. So, about 30 minutes before I’m heading to bed, I make sure to turn off electronics and start winding down. Studies have shown that checking your phone before bed and ultimately stressing your eyes with too much light can have negative impacts on how you sleep. “People are exposing their eyes to this stream of photons from these objects that basically tell your brain stay awake, it’s not time to go to sleep yet,” Dan Siegel, clinical professor of psychology at the University of California Los Angeles, told Business Insider. The latest clock update for iPhone also has a Bedtime feature that can remind you at 30 minutes (or however long you think is best) before you go to sleep. It could almost end up being a ‘reverse alarm’ (an evening alarm but without a morning alarm). Setting a specific sleep routine that involves shutting off electronics and relaxing can help prepare your body to wind down properly. I’ve learned to trust my body when I wake up. Not to pay attention to the time and decide if it’s too early to be awake, but to ask myself how I feel when I first wake up to make sure I got enough sleep. I totally understand that this can be tough though and it’s something I’ve struggled with myself quite a bit. 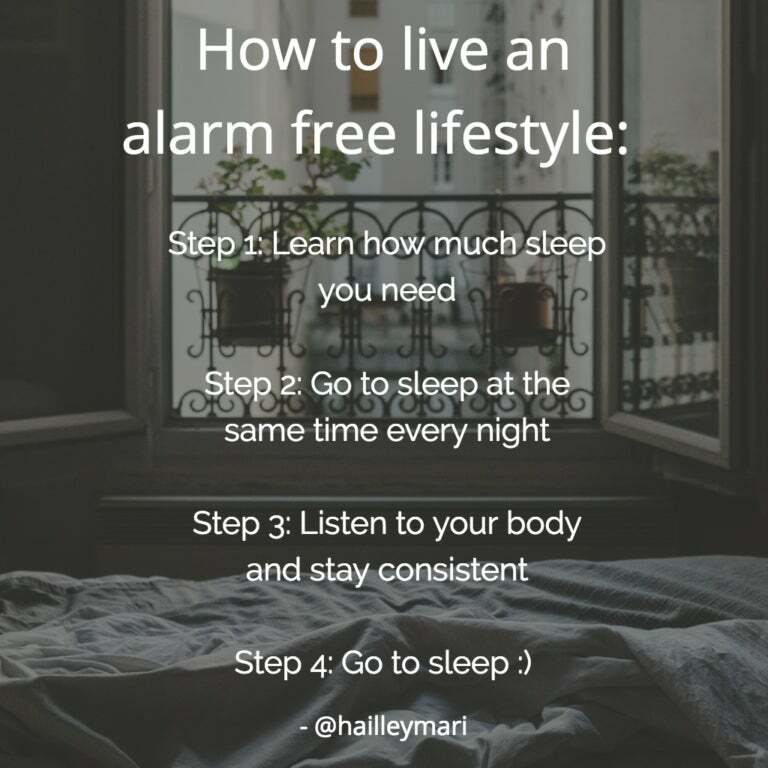 In the beginning, I would set a back up alarm, which is an alarm for weekdays that would wake me up at the last possible moment before I would have to start getting ready in the morning. I found though, that after analyzing how much sleep I really needed, I would generally wake up at the 8 hours mark -- if I go to sleep at 10:30 p.m. that means waking up 6:30 a.m. I would then set my alarm to 7:30 a.m. (depending on the day) but found more regularly I would wake up right around 6:30 a.m. Weekends are another great one to keep in mind. I’ve read in a few places that it’s healthy to get the same amount of sleep every night, and keep a consistent pattern. One study by Northwestern University says going to sleep at the same time every night could lower the risk of heart attacks. And Stanford claims that keeping regular sleep hours will help you be more alert and manage your time better. Consistency is the key to all of this. 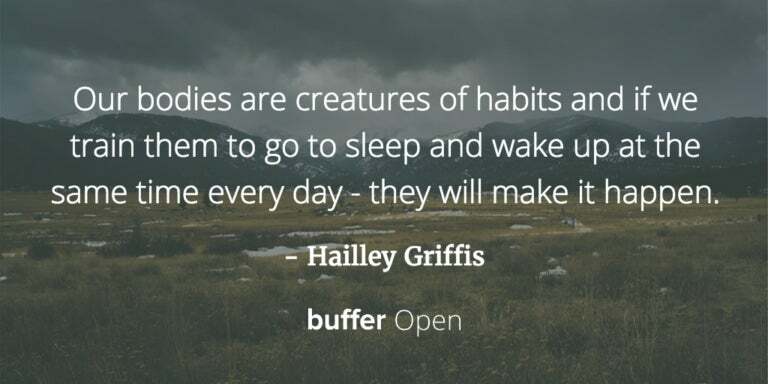 Our bodies are creatures of habits and if we train them to go to sleep and wake up at the same time every day -- they will make it happen.